Have you recently been called by someone claiming they are from Google? Recently, we’ve seen a spike in cold calls to businesses from someone claiming they’re from Google. “we’ve noticed your business doesn’t rank for certain keywords that it should and this is a big problem”. Essentially using scare tactics to get you to act quickly and irrationally. They may also offer you a ‘Quick fix’, where for a small fee they can get you to the first page or even number 1 on Google search results for these particular keywords. For people in the know, it’s an obvious scam, but smaller business owners can fall for this trap. I just want to point out that there are digital media companies who rely on a cold call to make business. Even though this method has a very low success rate and even lower client retention rate, they are definitely not scammers. The information i’ll be sharing with you today is only aimed at spotting these scammers. Whilst ranking highly for relevant keywords is important, the very top tier keywords are usually dominated by the big brands. This is because they have the resources (and sometimes entire departments) to spend lots of time and money ensuring they beat everyone else to that top spot. This makes it very hard for smaller businesses to compete, and instead should look for “low hanging fruit” where they can. With this being said, keywords this scammer is referring to are probably very low ranking and don’t get many searches. So even if they do get you to number 1 for these keywords, it won’t improve your sales. It’s also important to note that ranking for the wrong keywords can hurt your websites ranking in the long run. This information goes for any cold call you receive about your digital marketing strategy and in particular, keyword ranking. Google will never call you out of the blue. If you are using Google Ads, an account manager will contact you first via email. They will introduce themselves and arrange a time that suits you to conduct an account review. If you ever get these emails I highly suggest you accept as they are very professional and can improve your Ads campaigns in just a few minutes. If you’re trying to claim a business location on Google Maps using Google My Business, they may call, but only if you have ticked the box stating they can. Use scare tactics to get you to make a decision. Offer to improve your website ranking on Google. Ask you for passwords or verification code for Google My Business. Call you via a recorded message or robocall. Offer to manage your online profile. If you aren’t expecting a call from Google, then it’s a good chance it’s a scam. Scammers are out there with a focus on winning your business, rather than helping it. Even if the caller is from here in Australia, would you want to place your digital assets and business’ reputation in the hands of someone you have never met? If you’ve received any requests or information from Google and you’re unsure about what your next action should be, feel free to contact Matt, our Google and SEO specialist. Are you really open when you’re open? One of my biggest gripes that happens with bricks and mortar businesses is in regards to opening and closing times. Businesses that close at 5:30pm, but already look closed at 5:15pm. Do you think that makes the customer feel comfortable or uncomfortable? It’s obviously the latter, and making customers feel uncomfortable is a problem for business. Being in a cafe and they start taking the garbage out and stacking chairs while you’re there (within the advertised opening time). Being at a retail store that starts shutting down computers and is more focused on packing up then helping you. Taking the signs in from outside before you’ve closed so to anyone passing by you look closed already. You might think it’s an efficient use of time because business is slow in the last 15 minutes, but let me promise you that giving a customer a substandard experience certainly won’t start attracting more customers. You’ll just end up getting quieter and quieter. Think of the big brands, they generally have a 10 minute and 5 minute call ready for their doors to be closed at that time. There’s a consistency, but they don’t reduce the experience you’re getting so they can get out early. The benefit behind a bricks and mortar store is that you have the opportunity to immerse your customer in an experience that online stores can’t match. How good is that experience if you’ve already started packing up or if you’re not ready when people arrive in the morning. Your customer experience should be like an event. You don’t rock up to a concert and they’re still setting up. The stage is set before you arrive. You don’t want the magic to be tainted because some of the musicians were just hanging out in front of the curtain before the curtain opened. And there’s another danger – they stop coming because you look closed! If you’re paying rent for a bricks and mortar store, it’s important you look open when you’re actually open – especially if you’re paying premium rent at a site that has good passing traffic. Life’s too busy for customers to remember when everyone closes, so if you look shut I just don’t stop. It’s that simple. Be open when you’re open, and close when you’re closed. If you don’t want to stay till 5:30pm then set the expectation that you close at 5:15pm and delight them if they come to the door and you grab something for them. Whatever you do, when a customer interacts with your business give them the full experience and your full attention. a.) Encourage feedback. Use your competition to get feedback on which product your audience prefers, or to find out more about what they do on the weekend for example. Choose something that will benefit your marketing. b.) Increase your audience. Ask a question like “give us your best caption for this photo” because the more people who answer the more you’ll fall into the newsfeeds of their friends, which will likely encourage some of them to participate. c.) Generating leads. This is all about bringing people closer to your product so they’re more likely to buy it or enter their name in a mailing list. The idea here is that you’re using a light touchpoint to encourage people to give you a more permanent way for you to stay in touch, i.e. e-mail. d.) Capturing data. Do you already have an email list but you want to know more about your audience and their preferences? You might want to get them to update their preferences (or even just a detail like their address) as part of a competition. e.) Changing behaviour. A competition is a great way to reward people for changing their behaviour to suit you better. For example getting people to come see you in a quiet time rather than a peak time. They may need to enter during your quiet time, but make sure you leave enough time to give them a ‘thank you’ for entering that encourages them to experience wht you have to offer. 2. Use a prize that your target audience will love. This is pretty obvious. And if you don’t know what type of prize your audience would love more, you could give them a choice. The upside here is that you also get to know your audience better. The more hoops you make someone jump through the bigger the prize needs to be. The simpler you can keep it the better. Too often competitions don’t make a big deal out of the draw, and then people wonder if it was legitimate or not. Make a big deal out of the winner so people are more likely to enter next time. Will you run the competition again? It should all come down to whether or not you achieved the goals you set out for in point number 1. Remember there are some things you shouldn’t do when running a competition. If you missed those from the last blog post you can read them here. The recent Bonds Baby Competition is a great example of using a competition to drive you closer, much closer, to their online store where they just happened to be having a 40% off sale. To participate you had to enter your email, then verify it with a link in your inbox. This is just one example of how you can move people from strangers through to likely customers in just a few clicks. It all comes down to experimentation, and honing in on best results. Remember, getting more likes and reactions isn’t everything! What damage is your Facebook competition causing? Last week my news feed on Facebook was clogged with ‘like and share’ competitions. Some were great offers, but what I really wanted to see was what my friends were up to. That moment compelled me to share these insights in to the “best practice” of Facebook competitions. Many people may simply not realise they’re breaking the rules and it’s hurting them. If you’re a business owner and your social media people are doing these competitions, then it may be putting your whole social investment at risk. By forcing people to share your competition, your information starts clogging up the newsfeeds of their friends who might not really appreciate it. You could actually be pushing your potential customers away and they may even click ‘hide or block’ to posts from your page. This will hurt your organic reach meaning you’ll have to rely more on paid boosting. Having 10,000 or 100,000 likes on a page might look good but it doesn’t necessarily add value to you, your business or your followers. People are probably only liking your page because they want the free stuff not because they value a relationship with you. Competitions are best used when you’re gathering useful information from your followers that are most likely customers, not just quick answers from any person chasing a prize. Shares can’t actually be seen or measured by the business holding the competition. Likes and comments are OK, and people can share and tag if they like but making a share a condition of entry isn’t truly fair because it can’t actually be checked. The only difference to this rule is that using a third party competition app actually DOES have the ability to measure shares. A like and comment competition is fine. It could actually give you some great answers to a question and be a bit of fun – it’s encouraging quality conversation. However, asking people to share as a condition of entry artificially creates an influx of data to the facebook algorithm which can skew what people really want to see. Imagine if a multinational company did a ‘like and share’ competition it would lock up news feeds. Sure lots of people will see you, but will they respect you, trust you and can you sustain their interest? If impeding quality engagement, or having potential customers blocking you isn’t enough there’s always the chance that Facebook will dish out a direct, more obvious punishment like closing your page. Last year I saw a business who had a personal profile labelled as their business and had collected several thousand friends. This was against facebook rules and out of the blue that rule was enforced, resulting in the business losing all of those contacts overnight with no warning. You may not get punished for breaking rules immediately, but you’re taking a massive risk. Just like raffles and competitions that we see in the flesh, promotions online may also need permits. These laws change from state to state and country to country. In the online realm your competition knows no state boundaries. So just make sure you have the right permit for where ever your followers may want to enter from. For example, in Tasmania a permit is not required, but if someone in another state was to enter they’d be entering illegally because we don’t have a permit in that state. Let’s make sure you’re not making any of these mistakes, and in our next edition we’ll share tips on how to run a great competition that adds true value to your business and your followers. Oh… and just in case you love reading rules, here are the promotion guidelines for Facebook. 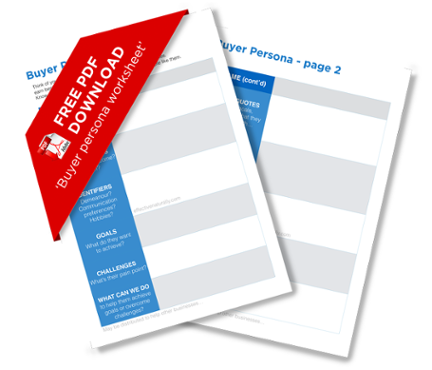 To help identify your ideal target customer download a copy of our FREE Buyer Persona worksheet and think about who you’re really connecting with. Your best customer isn’t everybody. Hashtags on Facebook: Yes or No? Is your Brand an all-round Habit?